The DAKINE ISA World Junior Surfing Championship Officially Opens as 30 National Delegations Participated in the Opening Ceremony. ISA President Aguerre meets with Nicaraguan President Ortega. The DAKINE ISA World Junior Surfing Championship Presented by Billabong officially opened Saturday, June 8, 2013. In attendance were nearly 300 of the world’s best Junior Surfers from 30 countries, who traveled to Nicaragua from every corner of the globe. Local authorities, government officials and thousands of enthusiastic Nicaraguans were witnesses to the start of the biggest Junior Championship in the world. Upon arrival to Nicaragua, ISA President Fernando Aguerre, was welcomed by Nicaraguan President Daniel Ortega, at the President’s Office, “La Casa de los Pueblos.” More information in a separate release. 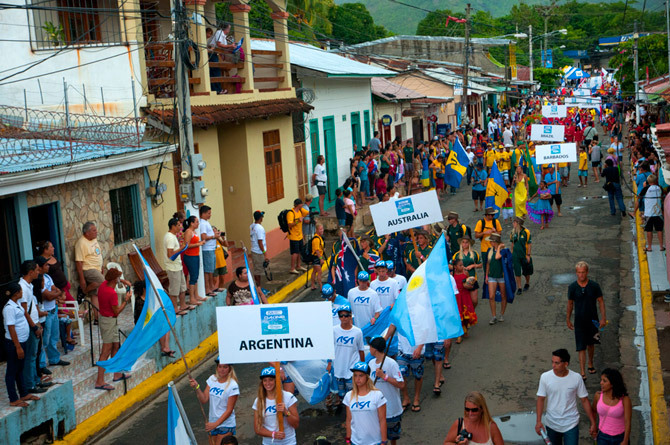 The National Delegations congregated in the heart of historical and beautiful San Juan del Sur, parading through the streets filled with thousands of supporters. The final destination was the main stage at the beach at picturesque San Juan del Sur Bay as the sun was setting over the Pacific. Two representatives from each National Team walked on stage, one waving the national flag while the other poured sand from their local beach into a glass container, symbolizing the peaceful gathering of nations through the love of surfing. The athletes and spectators were treated to a series of Local traditional dances that had people on their feet cheering and dancing. One particular dance know as “El Viejo y la vieja,” or “The Old Man and the Old Woman” was one of the favorite as the dancers went into the crowd and danced with the spectators, providing great entertainment while showcasing the local culture. 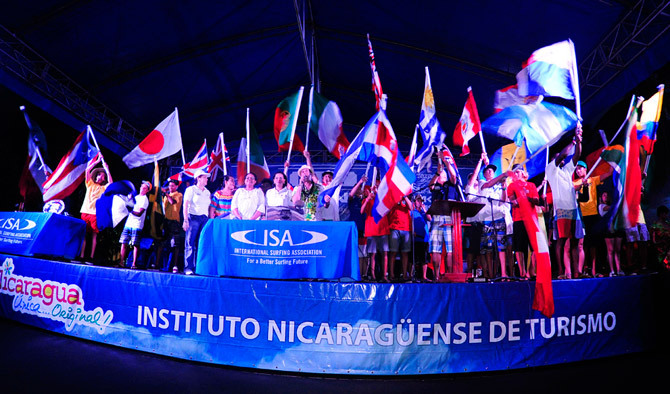 After the beautiful showcase of local Nicaraguan traditional dances, ISA President Fernando Aguerre and Minister Salinas officially declared open the 2013 ISA World Masters Surfing Championship. The event starts on Sunday with The Morning Show hosted by Chris Ernst and Mateo Rojas at 7:40am (local time) followed by competition at 8am with Round 1 of Qualifying Boys under-18 and Boy under-16.